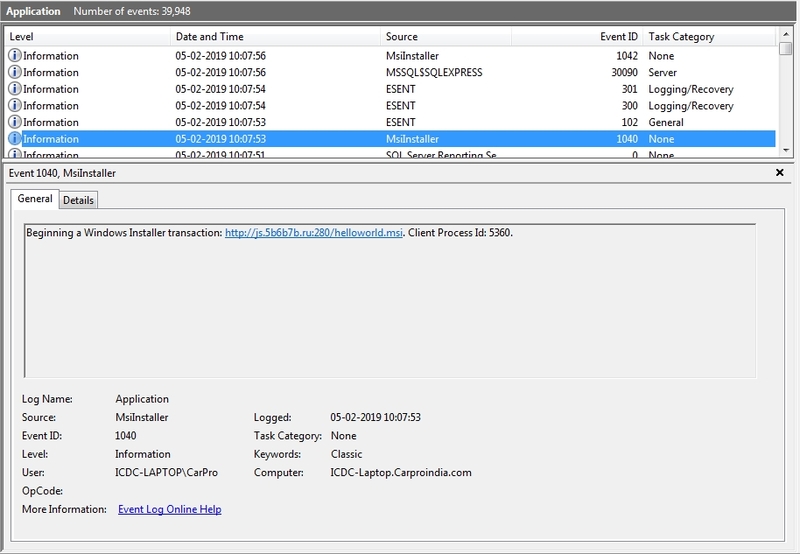 Recently, while checking the windows application logs, I found that an application communicates with a certain website. The process starts and ends in about a minute. It does not appear in my search results. I have captured its details. It is acting suspiciously, but I am not sure about this. The domain name is not meaningful. The strange port 280 is used for HTTP. I can think of no legit reason for this log entry. I'm not familiar enough to prove it, but I'd consider your computer as compromised. I'd therefore recommend to reinstall it from scratch and change all passwords of services, you accessed with this computer. This procedure might be overkill, but as there is no way of telling what this software has been doing lately, you'd be on the safe side. What you need to do is to get a copy of that file and send it to VirusTotal or some other analysis site for review. Just looking at a log is enough to ask questions, but not enough to answer those questions. Not the answer you're looking for? Browse other questions tagged malware windows or ask your own question. Automatic connection from LSASS to different IPs. Is this the usual behavior? Makecab.exe at boot. Is it malicious? When MBR pirates grin as an indication of absolute pleasure! Are .dll files normally found in system32 but now in a user’s AppData folder always suspicious? Where you can run shellcode inside an ordinary process, what is a stealthy way to leverage that to get offensive Powershell code running from it? Protect client app in online game from cheating? How to safely watch pirated movies, open infected files?